I have written before about our mystery apple tree and our attempts to identify it. Every now and then I look at the tree and wonder whether it might be worth rejuvenating it with some serious pruning. However, long before we moved into the house, the tree had evidently been hacked back to the main trunk and few large stubs of the original head. As often happens, this was followed by rampant but poorly formed growth. The structure that was left just does not offer many options for rejuvenation. Thus, every time I consider it, I invariably decide to leave it to its decrepitude. However, the apples are quite delicious. On this scrappy old tree, few, if any, develop without blemishes, and most are pretty rough specimens, but the flavour and texture are wonderful. It is a fairly early apple with a short season of use, but during that time we have nothing to compete with it. Discounting the option of rejuvenating the old tree, it would be nice to have a new tree, in rather better condition. However, we are not entirely certain what variety it is. I suspect it is a Kerry Pippin, an old Irish variety, much planted in English orchards in the 1800s, but rarely seen nowadays. It is available from the specialist fruit nurseries that I have used in the past, such as Keepers Nursery and R. V. Roger, and I am quite tempted to order one to confirm or otherwise our identification. For now, though, with some help from my dad, I decided to attempt to propagate some new stock from the old tree. As seeds do not breed true, propagation of fruit varieties is achieved vegetatively, and most often by grafting. 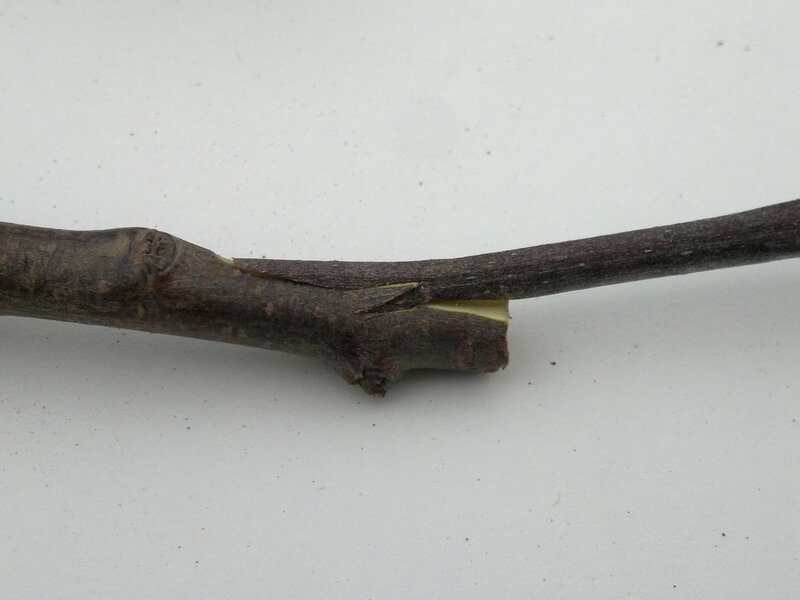 A section of wood, known as the scion, is taken from the donor tree and grafted onto a rootstock. The reason we use a rootstock rather than propagating by taking cuttings is that the rootstock controls, to a large degree, the vigour of the tree. 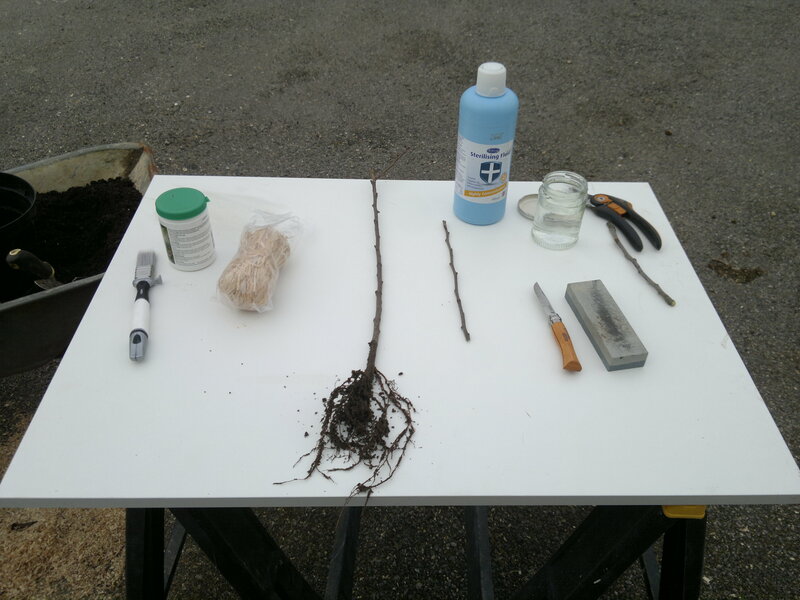 Rootstocks can be selected for their suitability for particular soil conditions and for improved disease resistance. Some two year old rootstocks arrived a couple of weeks ago from Ashridge Nurseries and were heeled in temporarily in the corner of one of the vegetable beds. They appear to be of good quality, with quite nice root systems. I selected MM106, a commonly used apple rootstock, being moderately vigorous, placing it somewhat between the vigorous stocks such as M25 and the dwarfing sorts such as M26. I do not like the especially dwarfing rootstocks such as M9 and M27, and prefer to maintain restricted forms by careful pruning rather than using a weak rootstock. I have never been convinced that the latter is a good option. 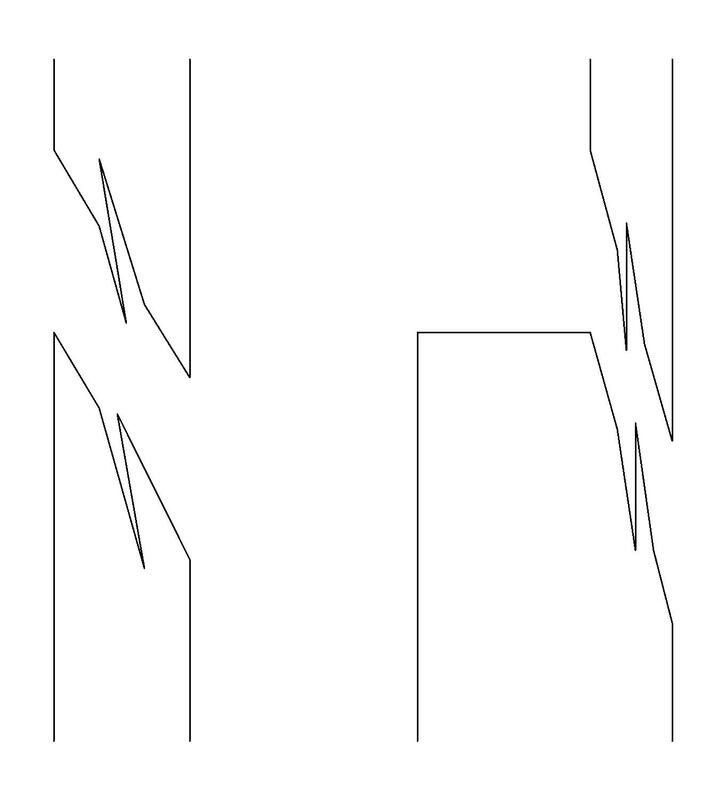 I am not sure what form I might grow these trees in, but I can use MM106 for pretty much anything I might want to develop. The only caveat with this rootstock is that it does not like especially wet areas; on our free draining soil that is not a problem. Grafting has been carried for thousands of years, but the amateur gardener now has little need to practise this art. 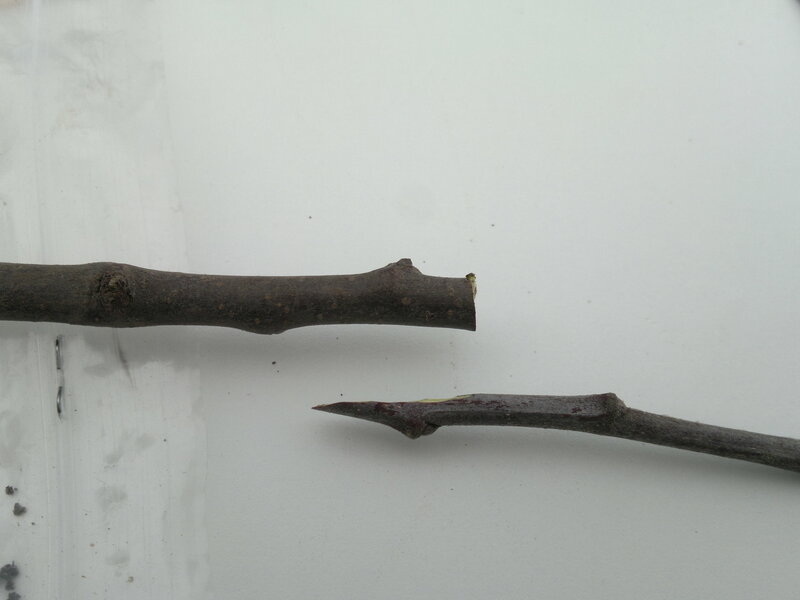 In theory, it is not complicated, but making a successful graft takes some practice. I bought five rootstocks to give me a reasonable chance of some success. 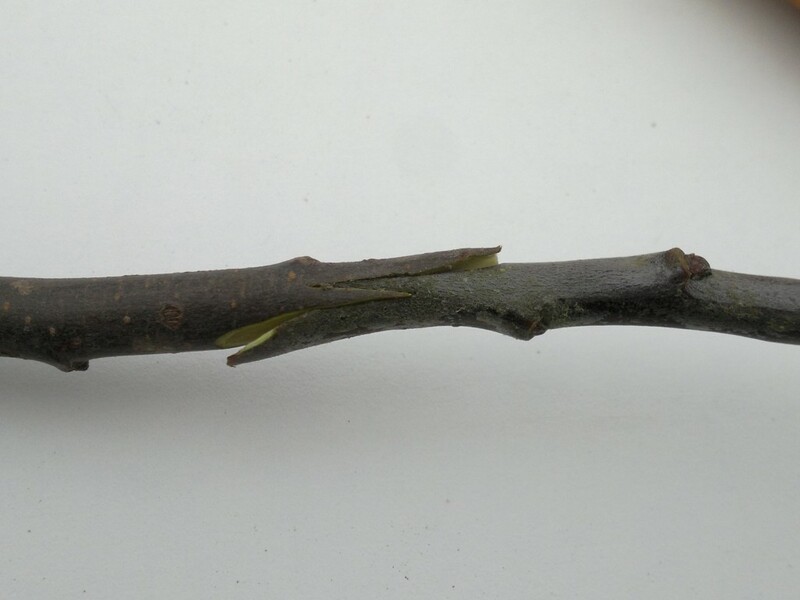 There are many different sorts of graft that one can make, some grafting in lengths of wood and others little more than a bud. Bud and chip grafts are made later in the year, but March and April is the ideal time for the sort of grafts shown here. 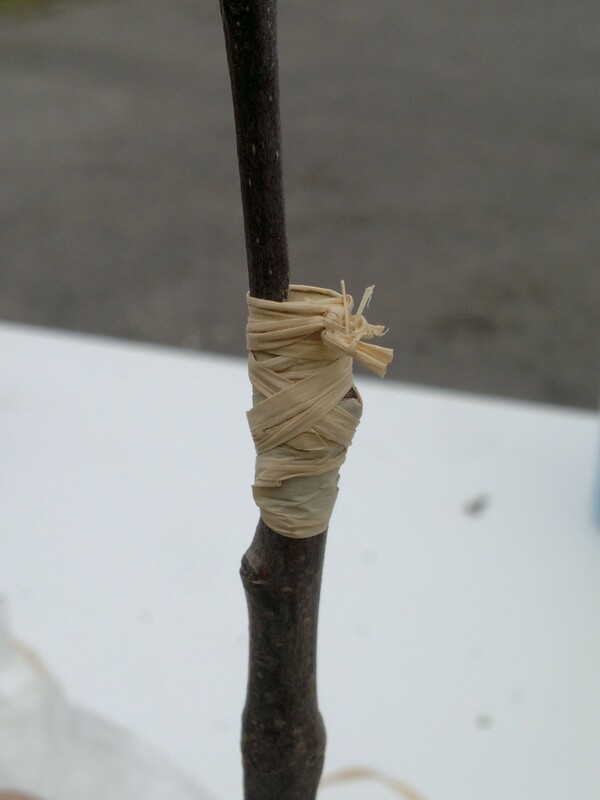 The traditional graft for fruit trees is known as a whip and tongue, and provides a good stable join. 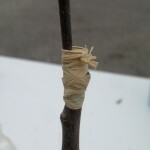 Although some sources seem to consider it a requirement that the diameter of the rootstock and scion are well matched, the whip and tongue graft can be performed equally as well when the rootstock is larger than the scion. The objective of any graft, aside from making some sort of mechanical joint, is to align the cambium layer of the scion and rootstock. This is a relatively narrow ring of tissue that lies beneath the bark and is responsible for transporting the sap. Unless there is a good alignment of these tissues the graft will not take. Before cutting any wood, we sorted out all of the bits and bobs needed for the job: a sharp, thin blade for making the cuts; secateurs for trimming rootstock and scion; sharpening stone for keeping a good edge on the blades; steriliser for cleaning the blades, to help avoid spreading disease; something to tie the grafts – we used raffia, a traditional material, although many people now seem to use plastic; and, finally, some grafting wax or sealant to seal the graft and a paintbrush with which to apply it. 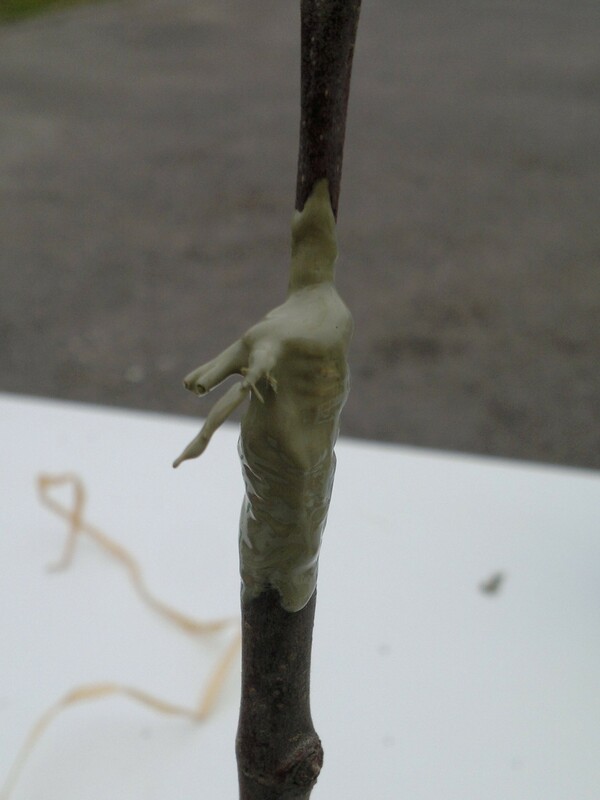 A suitable grafting wax can be made from beeswax, with linseed oil and rosin, but we used an off the shelf compound. 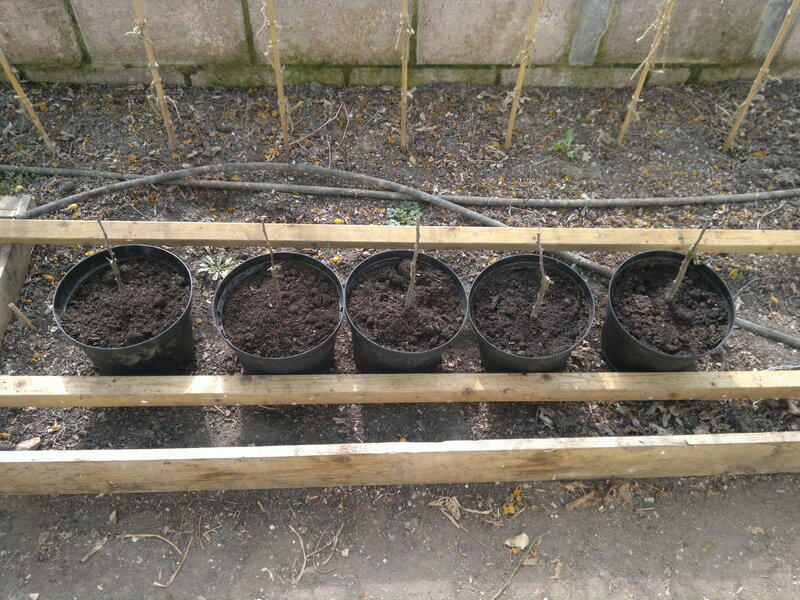 We decided to pot up the trees once grafted, rather than find a temporary planting site and move them later. 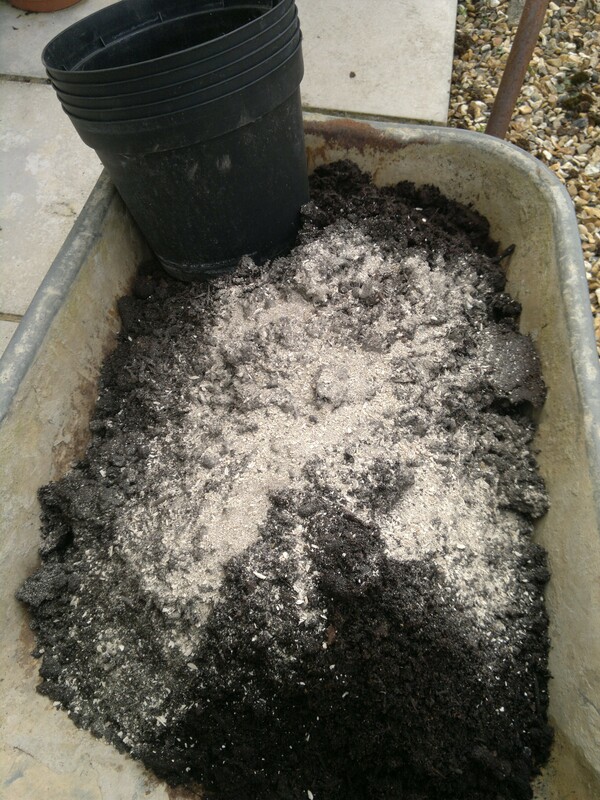 We used 7.5 litre pots and a mixture of multipurpose compost, with composted bracken and horse manure, and a good sprinkling of bone meal. With the equipment in place, we cut the scion wood, one at a time, then dug up one of the rootstocks, wrapping the roots in a plastic bag to prevent them from drying out while the graft is made. 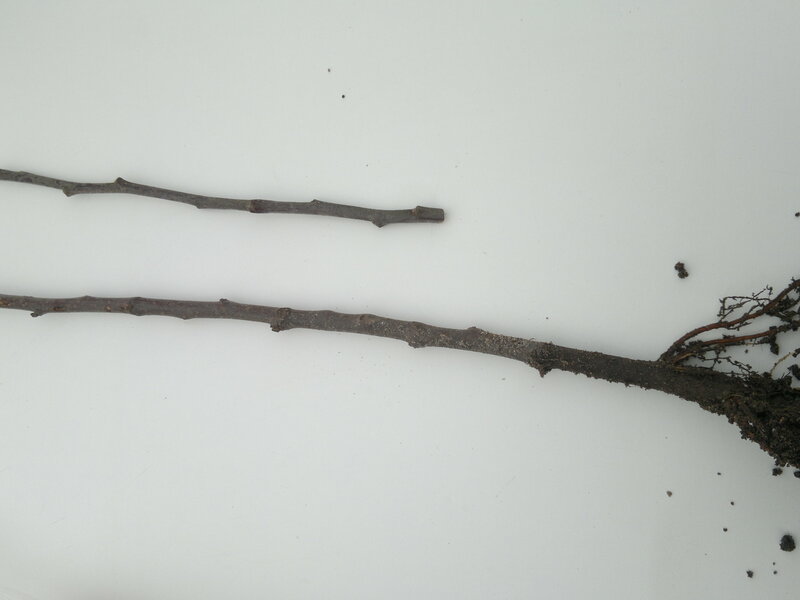 Whilst it is ideal if the scion and rootstock are of equal diameter, when one has various options for the sort of graft that can be made, our scion wood was a little hard to come by. The old tree is almost stagnant in its growth, and we had to hunt around for some suitable material. What is needed is a length of straight young wood from the previous season. 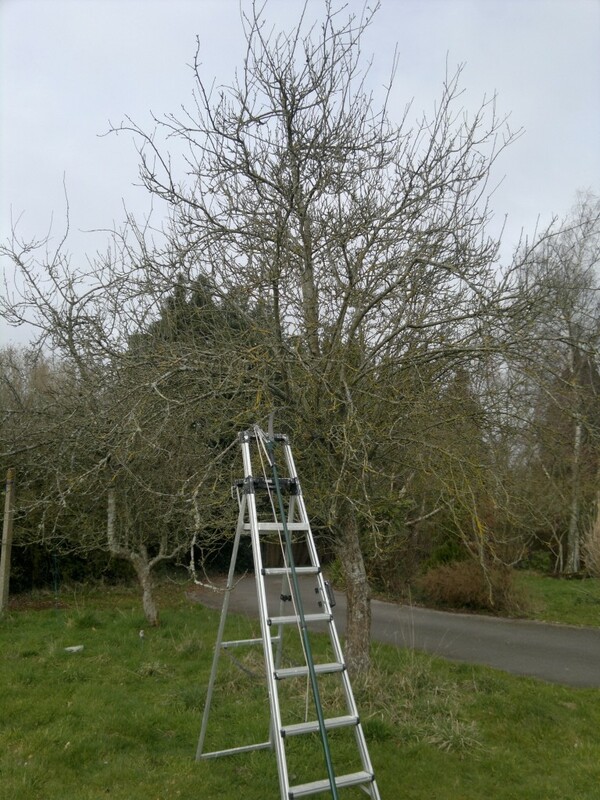 We found some at the top of the tree, and set to recovering it with the help of a ladder and long handled loppers. 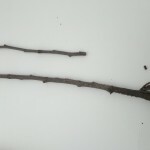 However, this young wood is rather thin, and of the five scions we cut, four were significantly thinner than the rootstock, thus dictating that we graft on the side of the rootstock. First, then, for the one scion that matched the diameter of the rootstock. The rootstock is cut straight across with secateurs at around six inches or so above the soil line. A slanting cut of an inch and a half to two inches is made on the scion, exposing an oval of wood. A matching cut is made on the rootstock. The two are offered up and the cuts adjusted, if need be, to ensure a good match. 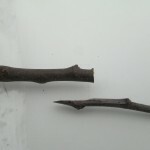 One could, at this point, bind the two together in position, but a more robust joint is made by cutting a tongue in the scion and matching slit in the rootstock. I cut the rootstock first, carefully opening a thin slit, starting from around one third of the way down the sloping face and proceeding for another third of the way. 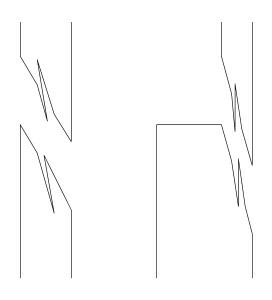 I then offered up the scion once again and noted where to cut to form a matching tongue; this will be approximately one third of the way up the slope from the tip of the scion and travelling a third of the way. 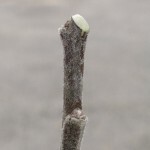 With the blade of the knife, the slit on the rootstock is carefully opened and the tongue prised open on the scion so that they slide together when joined. This is a little tricky to get right, and the first couple – the ones I photographed – are rather poor, compared with the last ones we made. In retrospect, it might have been a good idea to find some suitable wood to practise on a few times before hand. Once the joint had been cut, and the two halves positioned as accurately as possible, it was bound tightly in raffia and tied off. 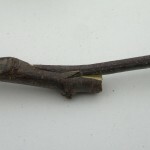 The scion can then be shortened, leaving three or four good buds, making a sloping cut with secateurs just above a bud. 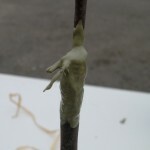 The graft area and the exposed tip of the scion are then covered with grafting wax. The resulting tree was potted up and watered in well. For those where the scion is narrower than the rootstock, the scion is cut first, then offered up to the rootstock so that one can judge where to make a matching cut to one side of the rootstock. Otherwise, making the joint is much the same. Now we have to wait – impatiently – to see how many of the grafts have been successful; hopefully at least a couple of them will develop. Later in the year, the raffia will need to be cut away, to allow the stems to expand, but for now, there is nothing more to do than keep them well watered. It will be some time before we can ascertain whether the young trees are healthy, or whether any disease has been transferred from the old tree, and longer still before we have that first fruit, so that we might finally enjoy one of our mystery apples in perfect condition. 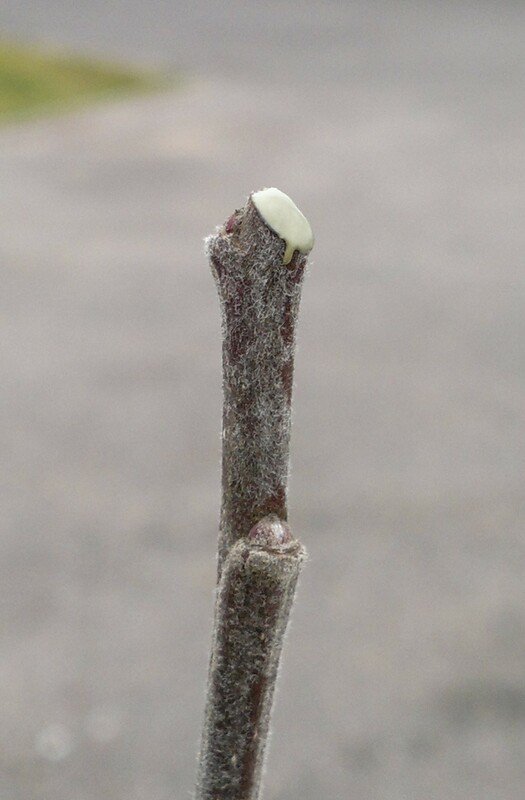 This entry was posted in Garden diary, Orchard and tagged apples, grafting on March 16, 2015 by JV.